This review originally appeared in the December 2000 issue (#148) of The New York Review of Science Fiction. 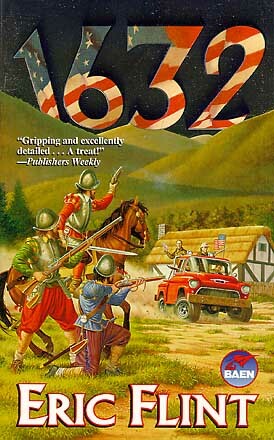 1632 is a novel whose popularity initially seems to defy explanation. If you go to Amazon.com, and pull up this book, you’ll immediately notice that the average customer review is four-and-a-half stars out of five. However, not knowing if this sort of thing was normal on Amazon, I checked out a few other time travel/alternate history books, which I thought were far superior, to see how they compared. Michael Swanwick’s Jack Faust: 3.5 stars; Harry Turtledove’s Guns of the South: 4.5 stars; Ward Moore’s Bring the Jubilee: 4.5 stars; Mark Twain’s A Connecticut Yankee in King Arthur’s Court: 3.5 stars; L. Sprague de Camp’s Lest Darkness Fall: 4.5 stars.